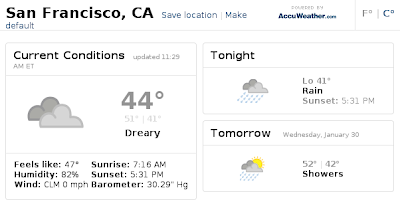 Whatever happened to "cloudy"? Just the facts please. There's just a ridiculous amount of frustratingly baseless analysis of this primary going on all over the place. I am spurred to weigh in. A month ago, Democratic voters liked all three of their front-runners, and Republican voters were not too excited about any of theirs. The turnout numbers from Iowa and New Hampshire still indicate this. A month ago, Obama and Clinton were the Democratic front-runners, and Edwards was trailing. The combined results from Iowa and New Hampshire still indicate this. Basically, as much as everyone's reading significance into primary results, I am inclined to say that the strongest signals point to no significant change from a month ago. We are exactly where we were; or at least, any signals indicating change are so weak that interpreting them is about as empirically sound as astrology. The simplest explanation for the seemingly dramatic swing from Iowa to New Hampshire is just temporal and spatial noise: random week-to-week and population-to-population variation. Call me back when there's a more robust indication of a trend and maybe I'll get excited. The chattering classes will chatter, as is their wont. But I find their diagnoses about as credible as the "financial analysts" who appear on business-oriented cable TV channels to state with a bogus air of authority that "tech stocks carried the markets higher today" or some such nonsense. It's random variation, that's all; or, at least, you have no evidence that it's not. Belatedly, I hereby link to this strip and declare it awesome. Cleans floor. Makes floor dirtier: cat hair, litter particles, etc. Makes floor dirtier: hair, skin particles, food crumbs, etc. Feeds self: docks at charging unit when it is low on energy. Cannot feed self: dependent on human to manage food intake, or else he gets incredibly fat. Feeds self: from takeout, grocery store, or free food at work. Cannot clean self: dependent on human to clean brushes. Cleans self: with tongue. Cleans self: with fixtures in bathroom. Cannot eliminate own waste: dependent on human to empty dust compartments. Eliminates own waste: in litterbox. Eliminates own waste: in toilet. Cannot pay for self: dependent on human to pay for electricity. Cannot pay for self: dependent on human to pay for food, litter, etc. Pays for self: supports apartment economy through cash inflows from outside job. If Roomba could clean itself and eliminate its own waste, it would be strictly more functional than Cat. If Cat could regulate its own food intake and get a job, it would be functionally equivalent to Human. Relationship between Roomba and Human is clearly mutualistic. By contrast, relationship between Cat and Human appears to be strictly parasitic, or else involve some exchange that is not captured by this analysis.